The A Class is an international standard. This means that no matter where you are in the world, a piece of A4 will always be a piece of A4. In essence, any piece of paper is considered to be in the A Class if it has the correct ratios (height vs lenth). This ratio has the unique quality that if it is folded in half lengthways, it will have exactly the same aspect ratio. 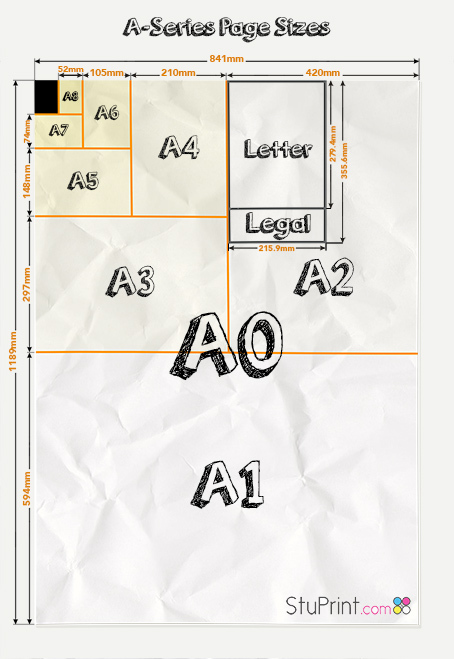 A0 (which is designed to have the area of 1 square metre), for example, becomes a piece of A1 when folded in half lengthways. This then becomes a piece of A2 and so on. This characteristic holds true for the other two main paper size families: B and C.
There’s not a lot to worry about with regard to paper sizes when using StuPrint.com. Our instant quote system handily tells you the exact size of the product you’re ordering. But its worth knowing a little bit more about paper sizes and how they relate to each other. If you’ve had a look round the site, you’ll notice the majority of our print products fall within the “A” Class of paper sizes. This is the most standard paper size- you probably haven’t gone a day in your life without seeing at least one piece of paper that belongs to this family. Because the use of A Class paper is so prevalent, we don’t list any others on StuPrint.com. But don’t worry, if you have the requirement for something a bit off the beaten track then we can sort that out- we’ll print any size paper you want- just give us a call. Heading for business card printing? Why not consider Spot UV gloss?